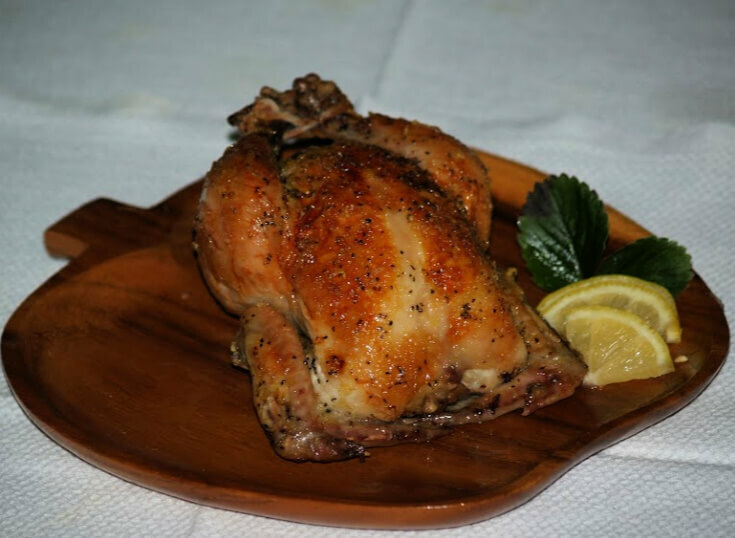 Cornish game hen recipes became popular for me after eating one at a dinner theater. This was the first time I ever heard of this little chicken. Known also by Rock Cornish hens, Cornish hens or just game hens, this little “bird” won me over. First I loved the presentation but the tenderness and flavor was great. The Cornish hen was the result of cross breeding a short legged chicken with chickens like Plymouth Rock varieties. Dad use to raise Plymouth Rock chickens. This was partly due to the hardiness in Ohio’s cold winter weather, but also because of the good meat and the great brown chicken eggs. Originating in Massachusetts in the nineteenth century, it became the most popular breed in the twentieth century. It is no wonder the Plymouth Rock variety was chosen for the breeding. The Cornish game hen recipes produce great tasting results because of this careful cross breeding. Small young chickens, either male or female are chosen to sell for this purpose. This is why the meat is so tender and flavorful. Also for this reason, these chicks can be baked, fried, broiled, boiled or grilled over hot coals. They also qualify for all types of meals from the simplest outdoor barbeque to the most elaborate holiday or special occasion. 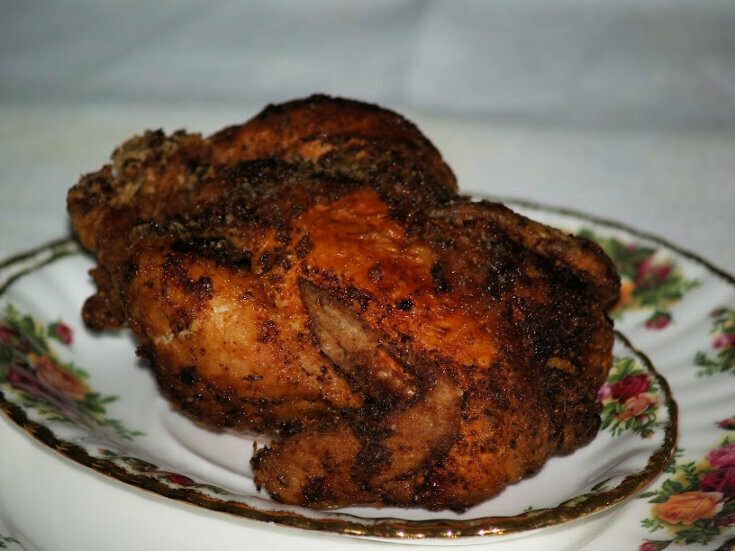 Flavor Cornish game hen recipes simply by using herbs and spices. Remove giblets (Save for other use); rinse with fresh water and pat dry. Split each hen in half lengthwise using an electric knife. Place hen halves bone side up in a shallow roasting dish. Pour 1 ½ CUPS of the wine over the hens. Combine and blend all the seasoning ingredients in a little dish. Sprinkle HALF of the mixture over the hens. Cover the dish and marinate in refrigerator 2 hours. Uncover dish, turn breast side up; sprinkle remaining seasoning over top. Bake 30 to 40 minutes until tender. NOTE: Baste frequently while baking; serve with rice. 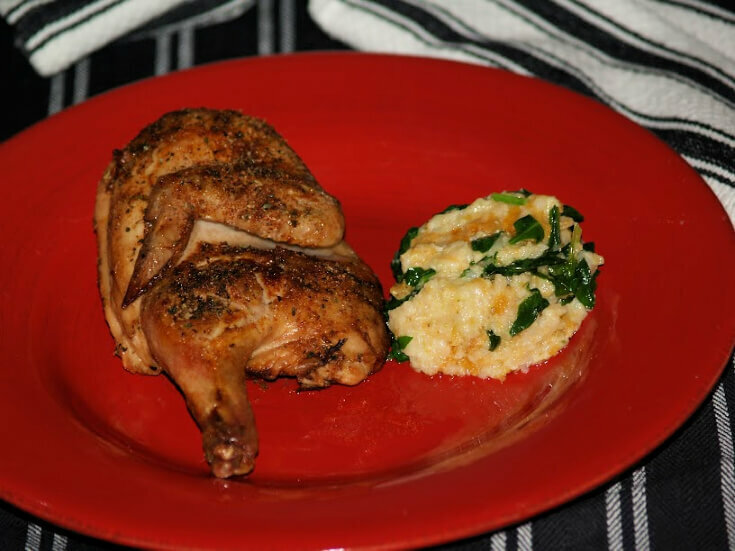 Cajun seasoning is delicious for many recipes including Cornish game hen recipes. Combine Cajun seasoning and the red pepper; rub inside and out of hens. Using a baster fill with dressing; squirt under chicken skin. Tie legs together with one end of a 30 inch kitchen string. Place flour in a large plastic bag; add the hens one at a time. Shake each hen in flour to thoroughly coat; place on a tray. Pour oil to a depth of 4 inches into a deep pot or propane fryer. Heat oil to 350F degrees; carefully lower hens into oil using the end of string. NOTE: CAUTION! Oil should cover the hens but you DO NOT want to fill the pot too full. If the grease boils over it will cause a fire. You can cook 1 at a time and just keep warm. Fry 20 minutes or until internal temperature of thickest part is 180F degrees. Flavors of lemon and apple go well in Cornish game hen recipes. Remove giblets from hens (save for other use); pat hens dry. Brush hens with vegetable oil; season with salt and pepper. Place hens on rack in roasting pan breast side up. Place in oven and bake 30 minutes. Combine and mix corn syrup, juice, peel and salt in small bowl. Bake hens 20 minutes longer until tender basting frequently with glaze. 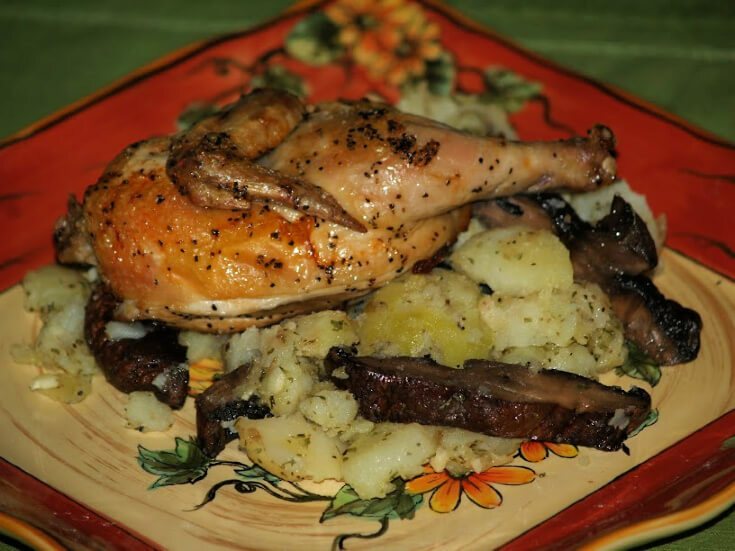 Cornish game hen recipe made with potato and mushroom salad. Bring to a boil, reduce heat and simmer until tender (25 to 30 minutes). Drain the potatoes; set aside. Brush mushrooms with 2 TABLESPOONS of vegetable oil on baking sheet. Sprinkle the mushrooms with each ¼ teaspoon salt and pepper. Roast about 15 minutes until cooked through and browned turning 1 time. Brush hens with 2 TABLESPOONS of the vegetable oil. Place hens on a large rimmed roasting pan cut side up. Sprinkle hens with ½ teaspoon salt and ¼ teaspoon pepper. Place in oven and roast for 12 minutes; turn halves over. Roast for 12 minutes longer or until juices run clear when pierced. Peel potatoes; slice potatoes and mushrooms ¼ inch thick; place in bowl. Add parsley, olive oil, garlic and vinegar to the bowl. Season with salt and pepper; toss gently to coat. Mound potato salad on 4 serving plates; top with hen half. Marinade adds lots of flavor to Cornish game hen recipes. Wash, pat dry, salt and pepper hens; place in shallow baking dish. Melt butter in a skillet; sauté onion and garlic until tender; remove from heat. Add to skillet mixture the broth, bay leaf, thyme and sherry; pour over hens. Cover dish and refrigerate hens overnight. Uncover hens and add mushrooms to the dish; bake 1 hour basting frequently. Serve with cooked rice; serves 2 to 4. Thyme and garlic spice up all Cornish game hen recipes. Combine and mix in small bowl 2 TEAPOONS thyme, seasoned salt, salt and pepper. Place in each hen 1 clove garlic and a full 1 teaspoon of seasoning mixture. Truss hen openings, tie legs together with string and bend wings under bird. Combine ½ CUP butter, LEMON JUICE, PAPRIKA AND 2 TEASPOONS thyme. Heat remaining ¼ CUP butter in medium skillet; brown hens on all sides. NOTE: Use more butter if needed. Arrange browned hens in roasting pan (No rack); brush with butter lemon sauce. Roast about 40 minutes until tender basting several times with butter lemon sauce. Flavors of orange ginger in Cornish game hen recipes. Remove giblets (Save for later), rinse hens and pat dry; place in bowl. Put garlic and ginger in food processor; process to almost smooth. In another bowl combine soy sauce, honey, oil, orange juice and peel. Add garlic mixture to the soy sauce mixture; blend and pour over the hens. Cover and refrigerate overnight in marinade turning several times. Place hens in shallow roasting dish; pour marinade over the top. Bake for 1 hour basting every 15 minutes; remove hens to a serving platter. Pour cooking juice into heavy saucepan; boil for 5 minutes until sauce thickens. Pour over hens just before serving; serve with cooked rice or cooked noodles. This raisin sauce is great for Cornish game hen recipes for holidays. Sprinkle body cavity of each hen with salt and pepper. Twist wing tips up and back securing the neck skin underneath. In a large bowl combine croutons, wheat germ, celery and broth. Blend in 2 TABLESPOONS of the melted butter. Add sugar, ½ teaspoon salt and ¼ teaspoon pepper. Mix well and lightly spoon into cavities of each hen. Tie legs and tail of each hen together to hold in stuffing. Brush each hen with SOME of the melted butter. Roast breast side up in open pan for 1 hour. NOTE: Baste with additional melted butter occasionally. TO PREPARE RED RAISIN SAUCE combine all ingredients in saucepan. Cook over medium heat about 10 minutes stirring occasionally. During last 15 minutes of roasting cut strings on hens. Brush hens with some of the red raisin sauce. NOTE: Game hens are done when legs move easily up and down and meat is tender. Serve with remaining sauce; serves 4 OR divide each in half for 8 servings. It is amazing what a jar of jalapeno jelly can do for Cornish game hen recipes. Sprinkle hens with salt and pepper. Place in shallow dish cut side down; set aside. Melt jelly in small saucepan over low heat; remove from heat. Stir in lime peel, juice, oil and cilantro; pour mixture over hens. Cover dish and chill for 3 hours turning occasionally. PREPARE GRILL with medium hot coals 350F to 400F degrees. Drain hens from marinade; bring marinade to boil in saucepan. Set marinade aside and keep warm. Arrange hens on grill rack over drip pan cut side down. Cover with grill lid and cook for 35 minutes. Brush hens with marinade; cook 40 additional minutes; serves 6. Cornish game hen recipes stuffed with wild rice. Rinse hens and pat dry; PREHEAT OVEN to 350F degrees. Melt butter in skillet; add 1 CUP of scallions and ½ CUP of the mushrooms. Cook until tender and liquid evaporates; set aside. Combine breadcrumbs, egg, sour cream, garlic and pepper. Add vegetable mixture to the breadcrumb mixture. Spoon mixture lightly into hens; truss. Place hens breast side up in shallow roasting pan. Cover with foil; roast for 1 hour. Uncover and baste with drippings; spoon off and SAVE 2 tablespoons. Return hens to oven and roast 30 to 40 minutes longer until tender. Place SAVED drippings in small saucepan. Add remaining ¼ CUP scallions and ½ CUP mushrooms to pan. Stir in the milk, water, gravy mix and nutmeg; stir and bring to boil. Simmer for 1 minute; serve hens on bed of wild rice with sauce.